I literally crawled into bed and threw the covers over my head, trying to hide from my husband. We had been up late the night before, and woke up early for church and Sunday school. I was so tired, the last thing I wanted to do was drag a sled up a sled hill. No, wait…I was so tired that the last thing I wanted to do was stuff two little girls into snow pants, boots, hats, coats and gloves, and THEN go drag a sled up a sled hill. “But I don’t want to go sledding!” I whined. “I’m tired, too, but if we don’t go now it’ll be too late,” Ed reasoned with me. And so I groaned and moaned and threw back the covers so I could start stuffing the kids into their snow pants. The day was clear and sunny, and the sled hill was crowded. The top of the hill teemed with kids, parents, and all kinds of sleds. But when we actually got in line, it didn’t take long. Lily was in seventh heaven, flying down the hill on her own. I started to panic at the thought. My baby, going down the hill with all these big kids, by herself! I’m not as daring as Lily, either. With great trepidation, I let go of her sled. She flew down that hill, and although I couldn’t see her face, I imagine she was laughing the whole way down. 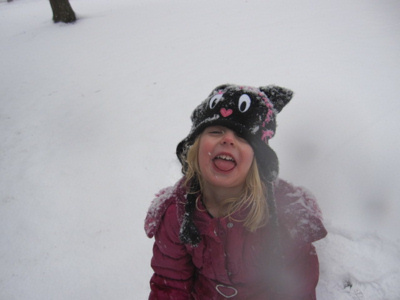 Then she picked up the sled and ran over to the side, out of the way of the big kids, just the way I had told her to. She went down that sled hill several more times, all by herself. So, was I glad that I had thrown those covers aside and forced myself up that hill? Was I glad I picked sledding over napping? Absolutely. We had so much fun on that brisk winter day, and we had been waiting for snow. On Monday, it started to rain, and all our beautiful snow turned to ice. Thankfully, we had had our one glorious afternoon of sledding before the rain set in. I don't like going sledding either. Only because it takes me more time to get Hudson into his snow suit than he spends outside! Lane is loving the snow now. I'm sure they had a blast! Sounds like a perfect day! I'm glad you went. I grew-up in Colorado, but I never skied. However, I would go sledding and tubbing all the time with my youth group and friends. So much fun! I'm in Florida now, so no chance of sledding anytime soon. Sometimes, forcing myself to do something leads me to doing something I never would have done and enjoyed it! It's so often in my life, too, that when I make the harder choice, I am most rewarded by the fruits of it. We haven't had any snow yet. I can appreciate the "not wanting to go" part, but CONGRATULATIONS to you for going anyway! Those are the moments we will remember the rest of our lives…. There have been so many times that I haven't wanted to get out, but it's always worth it. Glad you made it! Look at that face flush with victory! A memory to treasure…and the bed was still there after (and you may have really needed it by then!). Aw – what a fun day! Glad you enjoyed it even if you were tired. That's great that you finally got some snow! Sounds like fun! Awww, you're an awesome mom! Good for you! I know, it's hard to get out there, but once you do, the fun and fresh air make up for it.